* Complimentary use of snorkelling gear, tennis court and equipment, table tennis, board games and daily activities program. Advertised price valid for travel 1 Nov 19 - 31 Mar 20, add from $90pp for 1 Apr - 31 Oct 19, subject to availability, block out dates apply. Prices shown are a guide only, do not include airfare, based on low season availability & some conditions. Please contact one of our Holiday Champions for an exact quote on the dates you wish to travel & any conditions that may apply. 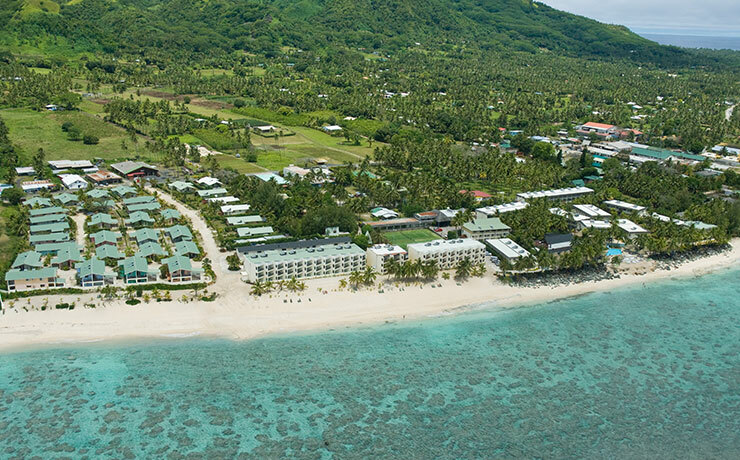 The 3 star Edgewater Resort & Spa is a warm, friendly and relaxed resort with a sheltered beachfront setting, white sandy beaches and a picturesque blue lagoon. It is the largest resort in the Cook Islands with 280 rooms and 34 3-bedroom villas spread over 6 acres of lush tropical beachside landscape. 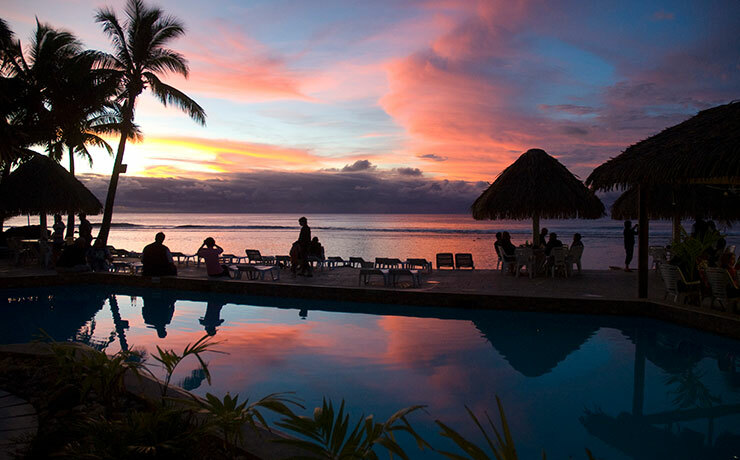 The Edgewater provides an authentic cultural Cook Islands experience, a large choice of accommodation options and plenty of things to do. The resort enjoys spectacular sunsets and avoids the characteristic winds on the eastern side of the island. The prime beach location combines an idyllic paradise with convenience, being in walking distance of some of the Island's best restaurants and only 10 minutes drive from the capital of Avarua. The resort's guest rooms offer comfortable, spacious accommodation, ranging from the newly renovated garden rooms to 3 bedroom Garden and Beach Front Villas. 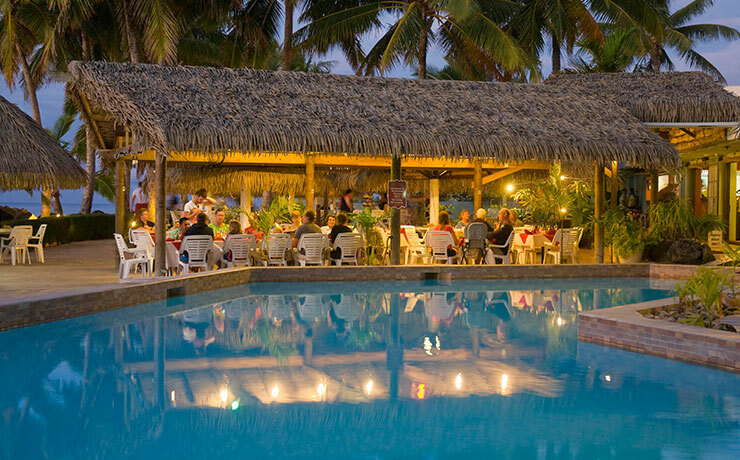 The resort is located on the edge of sparkling Arorangi lagoon on the West coast of Rarotonga, conveniently located only a 5 minute drive away from Rarotonga International Airport and 10 minutes drive from Avarua, the main township. The Edgewater Resort & Spa offers a range of activities and facilities. The resort's activities co-ordinators run a complimentary daily cultural programme specially designed to keep you entertained as well as providing you with interesting cultural information and an insight into some of the more traditional Cook Islands traditions. Activities boards are located in reception and outside Mal's Bar and have detailed information. Complimentary Activities: tennis, games room including table tennis and pool table, darts and table soccer, swimming pool, snorkelling gear, Coconut Kids Club, daily cultural activities programme. The resort offers 2 restaurants - The Brasserie and The Spaghetti House. The Brasserie is set right on the water's edge with a view of the swimming pool and the beautiful blue lagoon. This restaurant serves breakfast, lunch and dinner with a poolside snack menu available throughout the day. The Island Night Dinners & Shows are not to be missed. The Spaghetti House serves delicious Italian cuisine, including pizzas and pastas in a relaxing laidback atmosphere and is open each evening from 6.00pm. Mal's Bar is open from 10am to midnight and offers a fine selection of international wines and beers or perhaps enjoy a delicious cocktail or cool drink whilst watching the sunset. Live local entertainment plays at the Brasserie most nights. The 'Nightlife Tour' is run on Friday nights and visits some of Rarotonga's most trendy nightspots. All 280 rooms are comfortable and tastefully decorated in a fresh Polynesian style. Each accommodation block is named after one of the islands that make up the Cook Islands group and showcases the history, maps and photos of that island. A range of accommodation options are available, tailored to suit all tastes and budgets. From newly renovated garden rooms to large Beachfront Deluxe rooms and for larger families or friends travelling together the fully equipped 3-bedroom Garden and Beachfront Villas offer excellent value for money. All rooms feature air-conditioning with ceiling fan, private balcony or patio, in-room safe, iron/ironing board, hairdryer, IDD phone, television, free in-house movies, refrigerator and tea/coffee making facilities. Garden rooms and Garden Superior rooms overlook the resort's courtyard and gardens, they have just been renovated and are quite roomy offering tropical decor and great for the budget minded. Lagoon View rooms are set close to the water’s edge and overlook the white sand beach and blue lagoon. 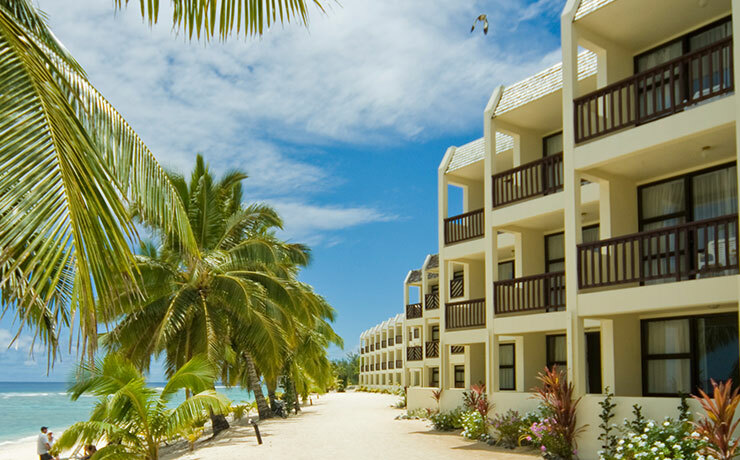 Beachfront Deluxe Suites are located just metres from the water's edge, right on the beach. They are extremely spacious and each features their own spa bath and separate shower, perfect for couples or Honeymooners. VIP Deluxe Suites feature a spa bath and look out over the beautiful blue lagoon. They are very spacious. Garden Villas and Beachfront Villas are spacious, have 3 bedrooms and 2 bathrooms and come with a fully equipped kitchen,l dining area, lounge area with TV and DVD, laundry facilities, and air-conditioned living area. These villas are ideal for those travelling with friends or children. They can comfortably accommodate 6 adults or 4 adults and 2 children. Children aged 12 years and under stay free when sharing the room with adults. Children will love spending time in the fun filled Coconut Kids Club with an action packed programme , playground and themed rooms that will keep children entertained and busy. The Kids Club is free to in-house guests and is open Monday – Saturday for children aged 4 years old and over. Crab racing, fish feeding, dancing, drumming, coconut demonstrations and tie dye fabric are jut a few of the activities on offer.. Children under 4 years of age can participate but will require their parents’ supervision during all activities. Honeymooners receive a bottle of sparkling wine and fresh fruit basket. If a minimum 5 paid nights are booked they will also receive a complimentary room upgrade to the next room category available, subject to availability. It must be stated that couple are honeymooners at the time of booking. Discover romance at the Edgewater Resort & Spa as you pledge your love on a powdery white sandy beach under the swaying palm trees with breathtaking views of the lagoon. The Resort offers a range of Wedding packages perfect for your special day. Ask us about their free wedding offer when booking a minimum of 5 rooms for 7 paid nights. Prices shown are a guide only based on 2 adults travelling and do not include airfare, please contact one of our Holiday Champions for an exact quote on the dates you wish to travel and any conditions that may apply. Prices are per adult and include transfers & twin share accommodation (maximum 2 children per room). Hotel specials have varied travel dates, block-out dates & high season surcharges may apply, especially during school holidays. Prices are also subject to change without notice due to currency, tax fluctuations & fuel surcharges.